♦ PERFECT TRAVEL COMPANION ♦ With our new compact design you can have reliable neck support anywhere you go. Whether you're traveling by car, bus, train or plane now you will never have to complain about your old neck pain! Made with premium memory foam that is soft yet supportive. Our versatile neck rest helps alleviate tension in the shoulders and cervical spine. ♦ CHIROPRACTOR RECOMMENDED ♦ Car headrests have a very large gap in between the seat and your head, neck and shoulders. This leaves you vulnerable to the stresses of long drives and injuries from vehicle accidents or sudden stops. Our neck rest fills in this crucial empty space with a comfortable padding that improves spine alignment and is chiropractor recommended. Alleviating muscle tightness and soreness from awkward positions. ♦ READY TO USE ♦ Each car neck pillow is pre-cleaned and completely odorless. Most competitors have a strong chemical smell and takes weeks to get rid of. But at A&A Creations we value your satisfaction so now our cushion pads are ready to use right out of the box! This makes the perfect gift for anyone who wants the support, care and comfort of an exclusive A&A Car Pillow. ♦ QUALITY GUARANTEED - We are a proud Military Veteran and family owned business and customer satisfaction is our first priority. No recycled or moldy memory foam here! The adjustable strap and plastic clip are made to last so you can enjoy driving in comfort for years to come. Comes with our No-Questions-Asked 30-Day Money-Back Guarantee..
Our vision is to provide you the highest quality accessories for your travel needs. We aim for perfection and want you to enjoy comfortable and stress-free travels. Driving for a long time in the same posture can easily trigger a variety of cervical problems. There is typically a large gap between a seat and your neck, head and shoulders. Normal seats are completely ineffective and provide little to no support. With our Compact and Comfortable Design your head can rest easy. Premium Memory Foam Pillow - Firm, yet comfy never worry about neck pain or tight muscles again! Easy to Use Strap - Adjustable and customizable for the perfect fit and placement, simply wrap the strap around the neck of the seat and buckle until you hear a click! Don't Complain about your Neck Pain! 5.0 out of 5 starsFeels like it’s part of the seat! 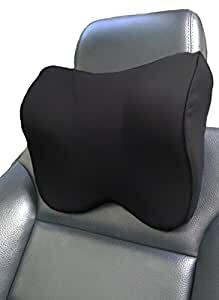 I never realized how poor my posture was when driving [or simply standing]until I strapped this pillow to my headrest. AMAZING! My overall comfort and relaxation has definitely increased while driving. The pillow is actually well made and much softer than most memory foam products yet it still provides great support to my neck. Sometimes I’m feeling sore after a glute day at gym and switch it over to sit on it! High Quality, I will be gifting one to my mom and sister! -Thank you! I have to drive a lot for work, I could be in the car anywhere from 4-8 hours a day which takes its toll on my body. I've used this pillow for 2 days now, and I already love it. My back and neck are much happier during long drives. The pillow is soft and comfortable on the skin but breathable so you don't sweat. I know I've only had it a short time but it definitely feels like it's helping. I will add an update after more use. Highly recommend this pillow for anyone needing more support while driving. 5.0 out of 5 starsA must have if your on the road nonstop. I’m skeptical when it comes to pillows and having been a dairy farmer for over 30 years my body has taken quite a bit of abuse. I was never comfortable traveling long distances to meetings till I got this travel pillow. I use it behind my back as a sort of boosted lumbar support and occasionally I’ve had to pull over at a rest stop to grab a quick cat nap so I use this pillow. It is so incredibly comfortable and on top of that well made. Basically top quality for the price. I’m gonna make sure to get some more for the rest of my family. Thank you for an awesome product. 5.0 out of 5 starsMore comfortable than I thought! I found out about this neck pillow through a friend during a 1 hour commute. He had 2 and one was strapped to the passenger's seat. When I first put my head back, I felt like something was in the way until I felt the foam mold around my neck! I decided to purchase one for myself and now it feels like something is missing when I ride in another car without it. Very soft and comfortable. Nice and soft, very squishable cushion inside. I use it as a headrest for my racing simulator chair and allows me to use my headphones with it, where as other neck pillows wrap around your ears.